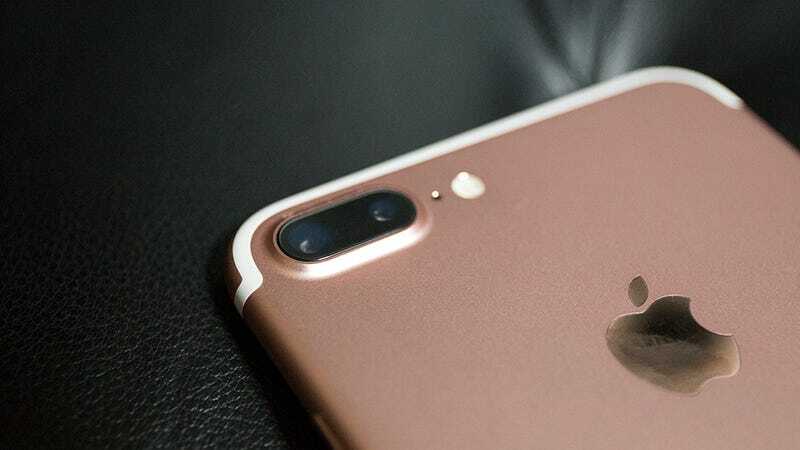 Some of the prettiest photos you’ll see this year will probably be taken with the iPhone 7 Plus. It has a portrait mode, finally made available to the public yesterday via the iOS 10.1 software update, that automatically applies a gorgeous blur behind the subject of your photo. (This is called “bokeh” in photo nerd parlance.) Babies look cuter, newlyweds happier, and pooches poochier with portrait mode. As Stu Maschwitz of Prolost pointed out back when the mode was first announced, portrait mode is an incredible feat of software engineering. It uses both lenses on the back of the iPhone 7 Plus to capture two images, which it uses as references. The software processes the data from each, calculates the optimum appearance for every segment of the photo, and instantly spits out an image that would usually require a grand worth of dedicated camera equipment. The results are often striking, but portrait mode is still software incorporated into one of the most popular smartphones on the planet. So it’s going to screw up, like when it blurred the spikes on this succulent plant below. Or when it blurred away the edges of this woman’s sunglasses and a good chunk of her hair. It screwed up royally here in the office too. I took a few snaps just to run the feature through its paces and figure out exactly what its limits are. It worked just fine in portraits of people. There were issues with it blurring out the edges of a subject’s eyeglasses, but overall people really “popped” thanks to the bokeh effect. It’s when the subject isn’t a person that the deficits of the software come into focus. In the image below, portrait mode decided to blur a reflection in this picture frame. It should not have. This is likely because it lacks situational awareness—it’s just a program on a camera. It isn’t reading the frame as a reflection, but as other detailed portions of the image that are not the subject and should thus be blurred out. But reflections are going to screw up any software of portrait mode’s kind. What I really wanted to test were details. How could it handle something exceptionally spiny like a cactus? Not well. It ends up reading all those fine spines like the fly away hairs on a persons head, giving the succulent below a weird halo. It’s hard to get too mad. This feature is called portrait mode, and it is clearly intended to photograph people. How is it supposed to have a cactus spine exception in its complicated blur algorithms? But that doesn’t explain this next photo, in which the software again struggled mightily with detail. In this image, it messed with Cher of Clueless fame. Thanks to portrait mode, the girl looks like she has had a rough night. Her hand and eyelashes have been blurred to oblivion, and her iconic plaid suit is a mess. The software also assumed the bright reflections on the table were part of the background—possibly because they’re the same color as some of the background. It’s a great example of how portrait mode struggles with reflections. If you’re shooting in bright sunlight or near the water or even just shooting a coworker with glasses, then be wary. Portrait mode won’t like what’s reflected towards it. What’s neat about portrait mode is how some images show off its internal thought process. In the shot below, it clearly knows the bright red straw is part of the subject and should be in relative focus, but it’s struggling to feather out the background, leaving the image with a hideous fringe. None of these deficiencies are deal breakers (unless you were planning on buying the iPhone 7 Plus exclusively for portrait mode). They’re merely bugs in a very advanced piece of software. While it’s easy to laugh at all the screw ups we’ve started to see today, it’s important to keep in mind that this sophisticated software has a very specific purpose. It’s for shooting people, preferably in good lighting, preferably sans glasses, and preferably with styled hair. If you’re not shooting people, then drop out of portrait mode, or prepare yourself for some blurry and fun messes.